This high pressure wash is for all vehicles that do not have smooth, flat surfaces. 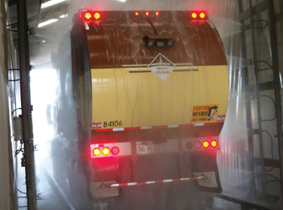 The high pressure waster jets combined with the correct chemical mixture reach into all corners, and are ideal for garbage trucks, tankers, construction and military vehicles. The Pseco 3 brush rollover is the most versatile system on the market. 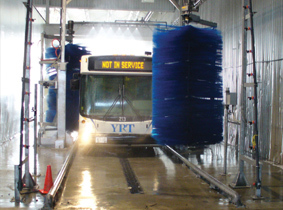 It will safely and efficiently wash trucks and trailers/buses/vans. These systems are ideal for the Fleet Owner looking for high volume with sparkling clean results. 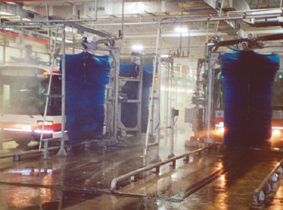 Brush rollover systems ensure a clean vehicle in less than a minute. A touchless rollover option is also available. 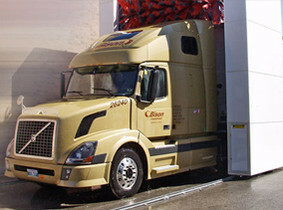 Brush Drive Through systems are ideal for Fleet Owners looking for high volume operations with sparkling clean results. Brush Drive Thru is a proven design with low operating and maintenance costs. The hot dipped galvanized frame is lifetime guaranteed, ensuring years of quality service. It washes a vehicle in less than a minute. Soft brushes shine your paint and decals. For the Fleet Manager who needs to wash a large number of vehicles in a short time frame with excellent results. The hot dipped galvanized frame is lifetime guaranteed ensuring years of quality service. It washes a vehicle in less than a minute. Soft brushes shine your paint and decals. The vehicle is driven through the wash system between the tire guide rails at slow speed. Electric eyes automatically control each function throughout the wash process. First, the Pre-Rinse/Detergent Arch rinses the surface of the vehicle while applying a detergent solution. Then the Roof Mop cleans the entire roof area. Next, the two Pseco-designed brushes wash the front, sides and rear. Detergent is applied to loosen the dirt and lubricate the brushes for complete cleaning, and increased brush life. The final Rinse Arch thoroughly rinses all dirt and detergent away leaving vehicles sparkling clean.